For the toun in Germany, see Ahrensburg. For the veelage in Tarvastu Pairish, Viljandi Coonty, see Kuressaare, Viljandi Coonty. 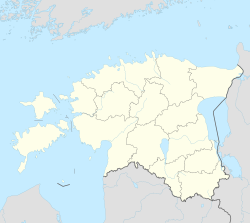 Kuressaare (Finnish: Kuressaari, German: Arensburg) is a toun an a municipality on Saaremaa island in Estonie. It is the caipital o Saare Coonty an the wastmaist toun in Estonie. The population accordin tae the 2011 census is 13,166. The ceety is situatit on the coast o the Guwf o Riga an is servit bi Kuressaare Airport, Roomassaare Harbor an Kuressaare Yacht Harbor. Its historic name Arensburg (frae Middle Heich German a(a)r: eagle, raptor) renders the Laitin denotation arx aquilae for the ceety's castle. The fortress an the eagle, tetramorph seembol o Saunt John the Evangelist, are depictit on Kuressaare's coat o airms an aw. The name wis replacit bi Kuressaare (probably meanin "Island o the Curonian fowk," wi the name o the fowk, the Kure, ultimately comin frae the Estonie kurg: crane) in 1918 efter Estonie haed declared its unthirldom frae Bolshevist Roushie. Unner Soviet rule the toun frae 1952 tae 1988 wis cried Kingissepa efter the Bolshevik Kuressaare-native Viktor Kingissepp executit in 1922 (no tae be ramfeeselt wi the Roushie toun Kingisepp, umwhile Jamburg). Kuressaare first appeared on maps aroond 1154. The island of Saaremaa (German, Swadish: Ösel) wis conquered bi the Livonian Brothers of the Sword unner Volkwin of Naumburg in 1227, who merged wi the Teutonic Knights shortly afterwards. The first documentation aboot the castle (arx aquilae) haes been foond in Latin texts written in 1381 an 1422. The ceety aroond the fortress flourished efter its building. It became the see of the Bishopric of Ösel-Wiek established bi Albert of Riga in 1228, pairt of the Terra Mariana. Johann von Münchhausen, bishop syne 1542, haed turned Protestant. Wi the advance o the troops o Tsar Ivan IV o Roushie in the course o the Livonie War, he sauld his launds tae Keeng Frederick II o Denmark in 1559 an returned tae Germany. Frederick sent his younger brither Prince Magnus tae Kuressaare whaur he wis electit as bishop in the follaein year. Frae him the ceety obtained its ceevic chairter, modeled efter that o Riga in 1563. The bishopric wis feenally secularisit in 1572 an Kuressaare fell tae the Daens croun. In 1645, it passed tae Swadish control bi the Treaty o Brömsebro efter the Dens defeat in the Torstenson War. Queen Christina o Swaden grantit tae her favourite Magnus Gabriel de la Gardie the title o a Coont o Arensburg, the German an Swadish name bi which Kuressaare wis kent at that time. The ceety wis burnt tae the grund bi Roushie troops in 1710 durin the Great Northren War an suffered hivily frae the plague. Abandoned bi the Swadish it wis incorporatit intae the Govrenorate o Livonie o the Roushie Empire wi the 1721 Treaty o Nystad. Durin the 19t century Kuressaare became a popular seaside resort on the Easter coast. Durin Warld War I (atween September an October 1917), German laund an naval forces occupee'd Saaremaa wi Operation Albion. Durin Warld War II, the Battle o Tehumardi teuk place. In October 1990, Kuressaare wis the first toun in Estonie tae regain its sel-govrenin status. The medieval episcopal Kuressaare Castle the day hooses the Saaremaa Regional Museum. The castle wis oreeginally biggit in firth atween 1338 an 1380, awtho ither soorces claim a fortess wis first biggit in Kuressaare as early as 1260. In 1968, airchitect Kalvi Aluve began studies on Kuressaare Castle. The toun haw wis oreeginally biggit in 1654, an restored, retainin clessicist an baroque featurs. It wis last restored in the 1960s wi dolomite stairs at the front. St Nicolaus Kirk wis biggit in 1790. Annual Saaremaa Opera Days (Saaremaa Ooperipäevad) are held in Kuressaare each simmer syne 1999. Ither festivals include Kuressaare Chamber Music Days (Kuressaare Kammermuusika Päevad), held syne 1995 an Kuressaare Martime Festival (Kuressaare Merepäevad), held syne 1998. Kuressaare hosts the FC Kuressaare fitbaa club an aw. ↑ 2.0 2.1 2.2 Bes, Lennart; Frankot, Edda; Brand, Hanno (2007). Baltic Connections: Denmark, Estonia, Finland, Germany. BRILL. p. 178. ISBN 978-90-04-16431-4. Retrieved 4 June 2012. ↑ Kjaergaard, Thorkild (1994). Castles around the Baltic Sea: the illustrated guide. Castle Museum. p. 64. ISBN 978-83-86206-03-2. Retrieved 4 June 2012. ↑ Murray, Alan V. (2001). Crusade and conversion on the Baltic frontier, 1150–1500. Ashgate. p. 11. ISBN 978-0-7546-0325-2. Retrieved 4 June 2012. ↑ 5.0 5.1 5.2 5.3 Taylor, Neil (17 August 2010). Bradt Estonia. Bradt Travel Guides. p. 255. ISBN 978-1-84162-320-7. Retrieved 4 June 2012. ↑ O'Connor, Kevin (2006). Culture And Customs of the Baltic States. Greenwood Publishing Group. p. 207. ISBN 978-0-313-33125-1. Retrieved 4 June 2012. ↑ Jarvis, Howard; Ochser, Tim (2 May 2011). DK Eyewitness Travel Guide: Estonia, Latvia & Lithuania. Dorling Kindersley. p. 32. ISBN 978-1-4053-6063-0. Retrieved 4 June 2012. ↑ Lang, V.; Laneman, Margot (2006). Archaeological research in Estonia, 1865–2005. Tartu University Press. p. 185. Retrieved 4 June 2012. Wikimedia Commons haes media relatit tae Kuressaare. Saaremaa for tourists. Photos an stories. This page wis last eeditit on 11 Mairch 2018, at 06:53.